….and a Blessed Christmas! It is still Christmas until January 9th, The Baptism of the Lord. As you may have noticed, I took a wee break from blogging. My favorite deacon, at long last, took some time off from his secular job. It was great to have so much time together. Deacon hubby always makes sure that we spend at least an hour talking even if he works long hours between his day job and Church. He is convinced that it is one of the main reasons that we have such a strong marriage. He is right of course. But I don’t know how he has the stamina to do all that he does. Anyway, I hope, dear readers, that you all had a wonderful Christmas. Ours was wonderful and a little sad. We really miss our children and grand children. I really got choked up talking to the grand babies. But I keep trusting that God has a plan. God the father knows best. Yesterday we celebrated the Feast of the Epiphany. We used to call it “little Christmas”. I wish that we still celebrated it on the 6th. Monsignor Pope has a post up where he addresses his concerns over the current Christmas calendar.If you are interested go read, On Time Warps and Missing Feasts: Puzzling Over the Confusion in the Christmas Cycle. 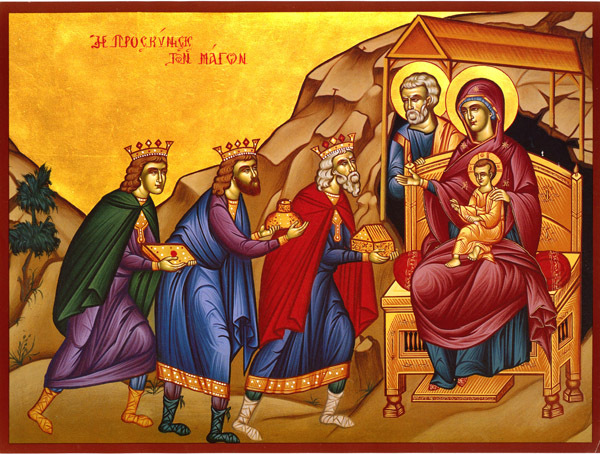 There are so many wonderful details in the Epiphany story: the call of the Gentiles, the nations, and their enthusiastic response, the significance of the star they see and the gifts they bring, the dramatic interaction with Herod and their ultimate rejection of him in favor Christ. In this meditation I would like especially to follow these wise men in their journey of faith. We can observe how they journey in stages from the dim light of a star to the bright and glorious Light of Jesus Christ. And, of course to authentically encounter the Lord is to experience conversion. All the elements of this story serve ultimately to cause them to “return to their country by another route.” Let’s look at the stages of their journey to Jesus, let’s walk the way of the wise men. To walk with Monsignor and the wise men, please continue reading, Walking with the Wise Men: A Meditation on the Feast of Epiphany. This entry was posted in Liturgical Year and tagged Christmas season, Epiphany. Bookmark the permalink.